One of the biggest storylines of this early 2011 season is the obvious offensive explosion that has occurred, especially when it comes to quarterback play. Three QBs have already thrown for over 1000 yards, and nine quarterbacks are averaging over 300 yards per game through the air, and it doesn’t stop there. Of the 32 quarterbacks considered to be “qualified,” 23 of them have a standard QB Rating over 80. Eight signal callers currently sit above the 100 mark, and almost half of the leagues field generals come in over 90. When QBs are universally playing out of their minds, how do we tell who’s really standing out and taking hold of the league? When league averages shift and context changes, we have to account for it in the way we evaluate players. If it’s easier to find a QB who can post a 90 rating then ever before, than those passers with ratings in the eighties aren’t so special any more. If you’re not convinced that we need to start comparing players to each other instead of just to the QB Rating metric, here is a chart that should change your mind. As you can see, the averages aren’t just up from decades ago, but they are up from as recent as 2000. So now that you can see that we need to make a change, how do we go about it? In comes QB Rating+. If you follow baseball statistics, you will be very familiar with the idea of a “plus” metric. A plus-metric compares players to the league average instead of their raw performances. 100 is the league average, while every point above or below is the percentage difference between that player and the average. 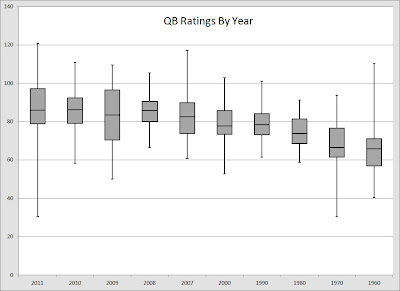 For example, a QBR+ of 105 would mean the quarterbacks’ rating is 5% better than average. A QBR+ of 95 would mean that the players rating is 5% worse than average. I could show you all the data in the world comparing players’ seasons using the QBR+ metric, but that’d just give you a headache and make me the least popular person on the site. I won’t do that to you, because I’m vain and desperately need your approval. Instead, here is a quick list of the top-5 quarterback seasons -- taken from the years 1960, 1970, 1980, 1990, 2000 and 2007-2011 -- according to QBR+. 1. Milt Plum, 1960 -- QBR: 110.4, QBR+: 168. 2. Tom Brady, 2007 -- 117.2, 140. 3. John Brodie, 1970 -- 93.8, 139. 4. Aaron Rodgers, 2011 -- 120.9, 138. 5. Sonny Jurgensen, 1970 -- 91.5, 135. One can clearly see that Rodgers’ raw QBR is the highest on this list, but because of the offensive climate in the current game, his QBR+ only ranks fourth. This occurs all throughout the list, especially when it comes to players from the offensive era of the 60's and 70's. Old fashioned QB Rating may be a silly and nonsensical stat, but if you’re going to use it to look at QBs, at least adjust for context. Who knows? QB Rating+ might just change your life. I'd like to see the full list. Never underestimate the nerdiness of those reading a football stats site. Interesting idea. I would recommend plotting chronological data with earlier data on the left. It's more intuitive for the reader. Isn't calling the traditional QB rating "QBR" confusing with ESPN's new total QB rating named "QBR" as well? I'm just about to put a good deal more data about this on the Community site. The changes in passing have been *really* signifcant over the years. 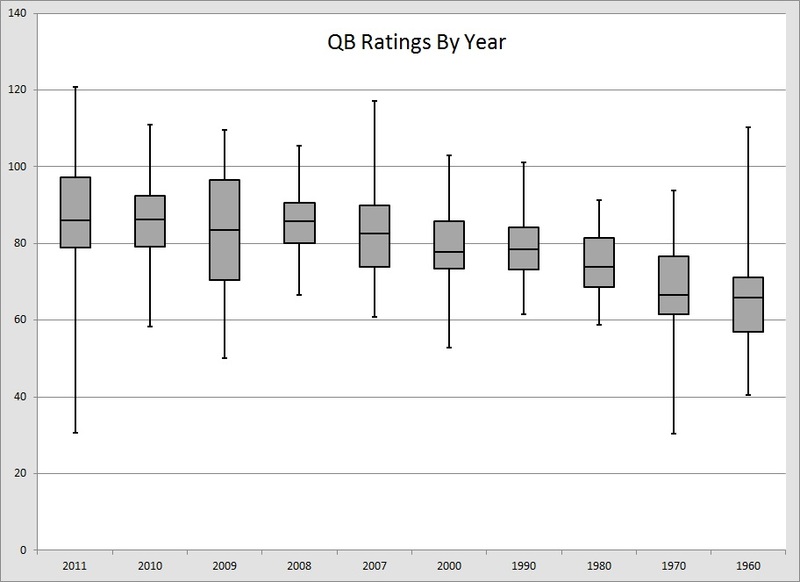 wouldn't this "percent better" skew in favor of the very low qb rating years? as an extreme, for instance an 80 rating when the mean is 40 cannot be matched in a year when the mean is 80 (100% is not possible). I think you're right Roger. Wouldn't it be more fair to find the number of standard deviations from the mean? Mike and Bob -- I would, but I'd feel silly doing it without doing every year, and not just the decade marks. G -- I have no clue why I didn't do that here. I suppose it's because I started with 2011 and worked my way back on the excel tabs? Yeah, that's it, I'm going to blame Microsoft. James -- I think of ESPN as TQBR, since that's what they seemed to call it at the beginning. They've made life very confusing for all of us. Roger and Anon -- That's certainly another way to do it, but I'm not quite sure how different the results would actually be. They may be skewed less, but how much? Thanks all for the comments thus far. Another thing to consider, since we're hearing a lot QBs on pace to break Marino's record for passing yards in a single season, is Marino's 1984 (the year of the record) Rate+ was 141. I agree, it's confusing to use the term QBR. You should have clarified that you are using the NFL's official passer rating. Also, it's pretty silly to compare a QB's passer rating after three weeks to some of the greatest seasons of all time. Offenses always cool down with the weather as the season wears down. There are two reasons why QB passing yards are up to start this season. (1) By returning the kickoffs to the 35-yard line, more kickoffs are resulting in touchbacks, and that means more offense is needed to score a touchdown. Offensive numbers will be greater for good passers. Just think: starting Tom Brady at the 50-yard line is good for scoring, but starting him at his own 20 gives him more vertical space to work with, and more passing yards for the same TD. Good QBs will feast on that extra vertical space. (2) NFL defenses were more hurt by the shortened preseason; they didn't have the time to put in more complicated pressure packages, so NFL defenses are playing more vanilla than normal so far. This will eventually even out, as defenses get caught up. Anon, I agree with you on 1, but why 2? Shouldn't the inverse, that offenses didn't have sufficient time to work on plays, timing, etc, be true as well? After all, before the season started I heard lots of people expect scoring to be DOWN as a result of the kickoff rule change and lockout hurting offenses more. Also, I'd prefer if everyone would compare this year's statistics to those from other seasons over the same time period (Week 1-3) so we can mostly remove the weather argument. James, I believe it's the nature of offense/defense that the lockout would affect defenses more. A defense needs to be sound, and the more pressure you bring, the more unsound you are. Coordinating that risk on the field is difficult. The offense has the attacking advantage, only needing to find one hole or matchup. Defenses haven't had their usual amount of time to install pressure. I think it's a weak factor, and I could very well be wrong about it. The big thing for me is the extra vertical space. I'd also like to throw in, that even if a defense brings pressure, they are always running the risk of getting flagged for a hit to the QB, which takes away some available yardage for stats. I would love to see a comparison of blitzes, sacks, hits on the passer, and defensive penalties for hitting the passer over the last decade. This is something we can test. If the lack of practice during the lockout has caused defenses to play poorly in the beginning of the season, as the season progresses, we should expect to see passing numbers revert towards the mean of previous seasons. Regression toward the mean doesn't occur during non-lockout years? I must have missed the day of my statistics course when that was covered! So the old fashioned QB Rating is a silly and nonsensical stat, but the improvement tells us that the best season since 1960 was produced by Milt Plum? Milt Effin' Plum? Nice guy, nice career. Best year ever? Time for a reality check.